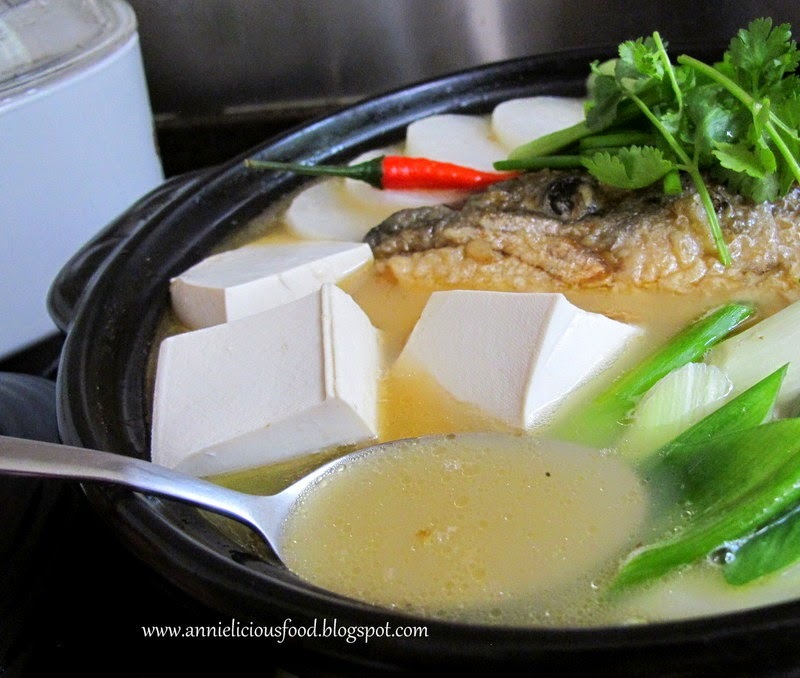 Milky and light brown fish soup, full of flavor and packed with nutritious goodness. Not only the fish head, there’s alot of fish bones in it too! It’s suitable for who needs a lot of nutrients. Like Calcium, Omega and other goodness. All in this pot of soup. On a side note… This soup is NOT FISHY all. It depends on how you cook it. This soup is indeed nutritious, delicious and versatile. You may replace with your favorite vegetables in this recipe. Besides, having a warm fish soup is so comforting especially during the cold weather. 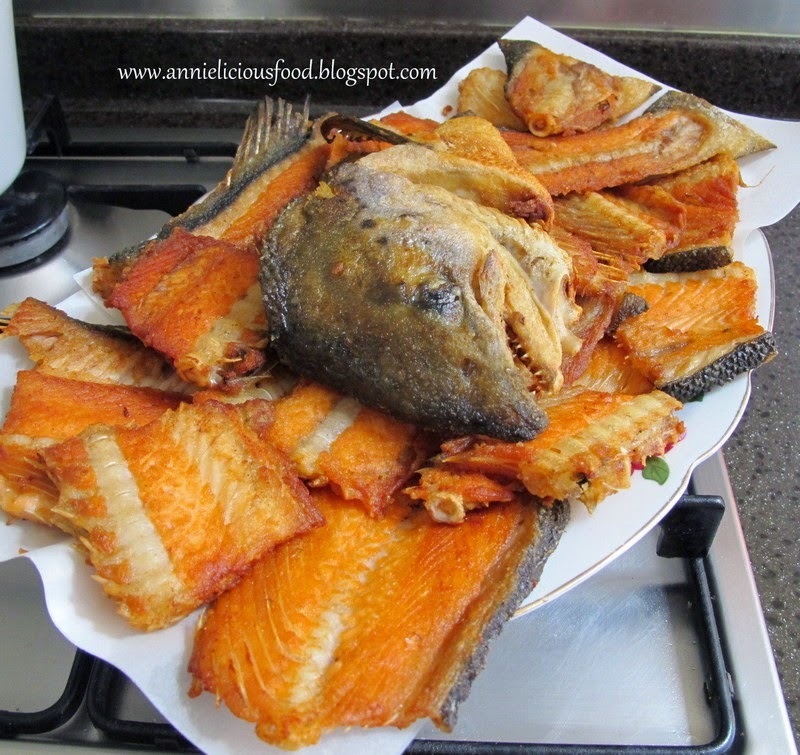 For those who often cook fish soup will know fish bones and head has lots of flavor. And this is how I prepare this soup…. 1. Gently, give the fish head and bones a quick wash. Drain them using kitchen towel. Yes, you will need quite alot of kitchen towels to do the work. But if you did it well, it would make pan-frying easier. Wet fish will makes your pan-frying fish experience turned disaster. 2. Heat up some oil in a wok, add in few slices of ginger, sprinkle some salt. 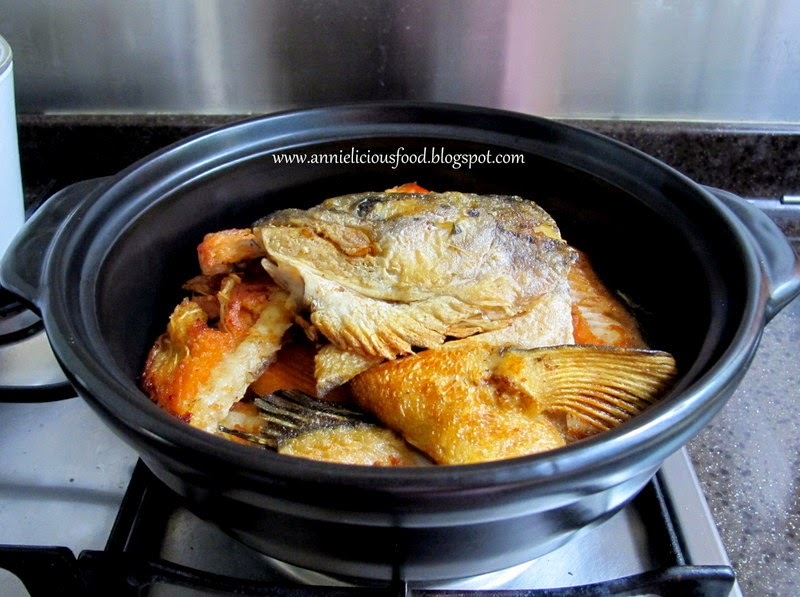 Under medium fire, pan fry the fish head and bones until lightly browned. You don’t have to put too much oil. 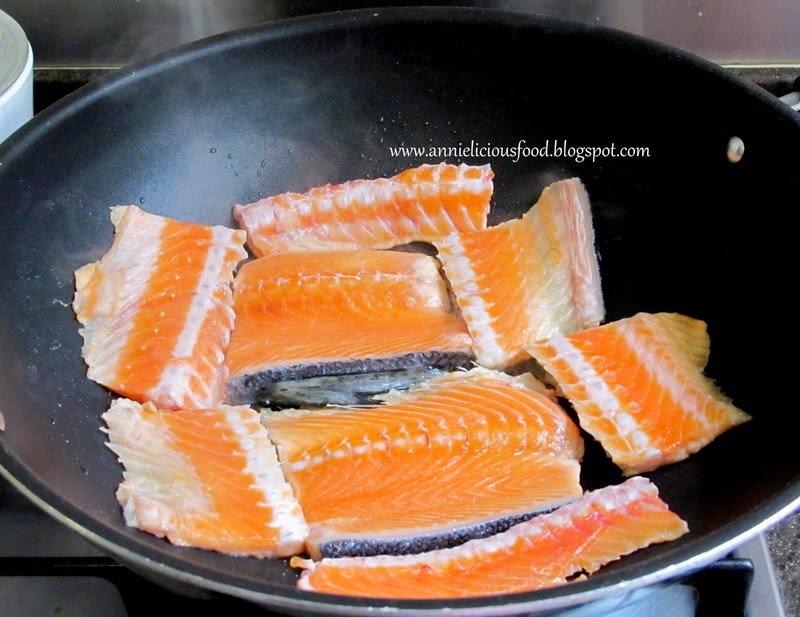 Salmon itself is oily. It will release oil on its own. 3. Let the fish rest on the paper towel to drain up some excess oil. All above fish bones and head is definitely too much for today. I divided them into two portion. 1 portion eat fresh, another portion wrap well and freeze away for next week. As I mentioned earlier, you may replace with your preferred vegetables. 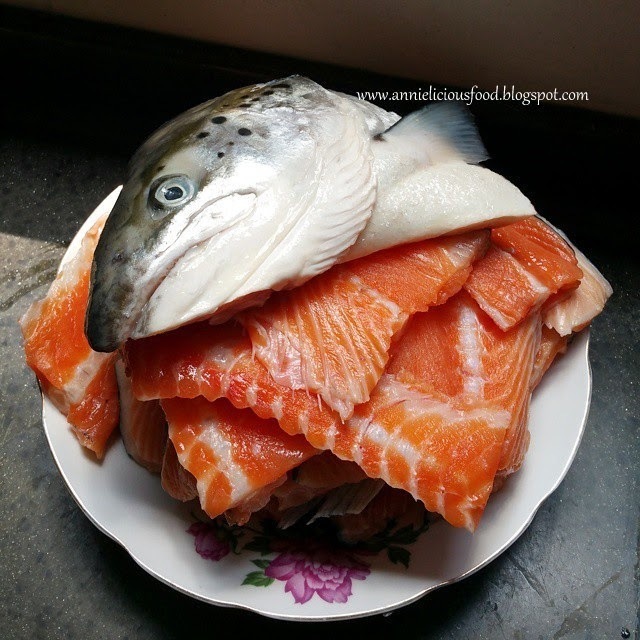 If you don’t like Salmon, you can use Threadfin bones or Red Snapper too. Add in more ginger if your tolerance of fishy smell is low. But as I said right at the beginning, this fish soup is not fishy at all. But that’s provided you follow my instructions. But I have to confess that pan-frying the salmon fish bones do makes your kitchen smells fishy. It’s unavoidable. If you pan-frying fish at home before, you will know what I mean. So, your kitchen do smells fishy after pan-frying the fish bones. But the soup won’t taste fishy. Is that clear now? Boil a pot of water. We need hot BOILING water. Don’t use room temperature water. In a pot or a casserole, heat up a tsp oil, fry the ginger and garlic till fragrant. Add in pan-fried fish bones and head. Cover up with lid, let it fry for 5 to 7 minutes or until the fish bones and head is well heated up. Keep an eye on it, and don’t burnt them. Add in the hot boiling water until the water covers the fish head and bones. This is important. 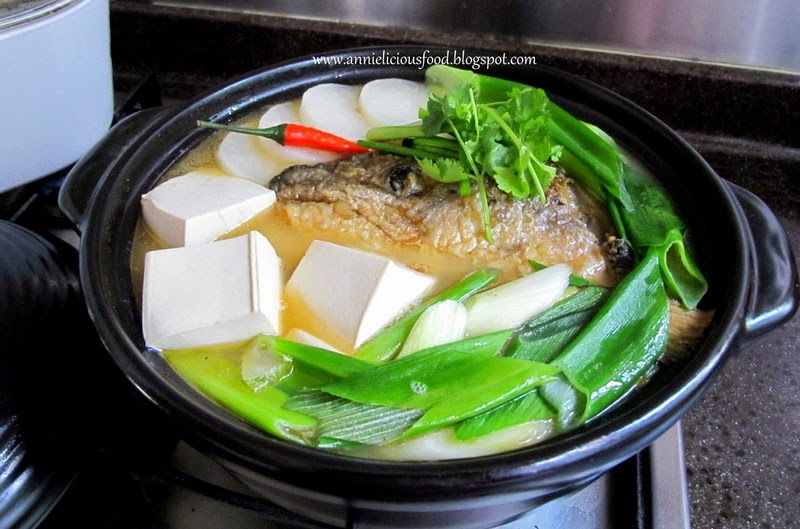 You have to follow this if you wants milky looking fish soup. Add chinese mushrooms and black peppercorn. Turn fire to high heat and let it boil for 10mins. And then, add tofu, turn to medium low heat, and boil for another 10mins. 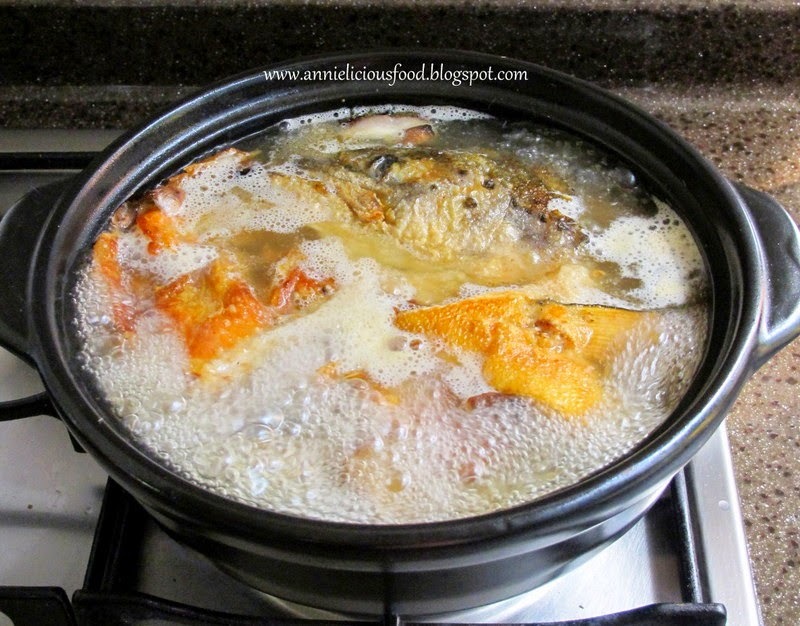 Remove any scums and oil floated on top of the soup during boiling process. Don’t be lazy. Try to keep as little oil as you can in the soup. 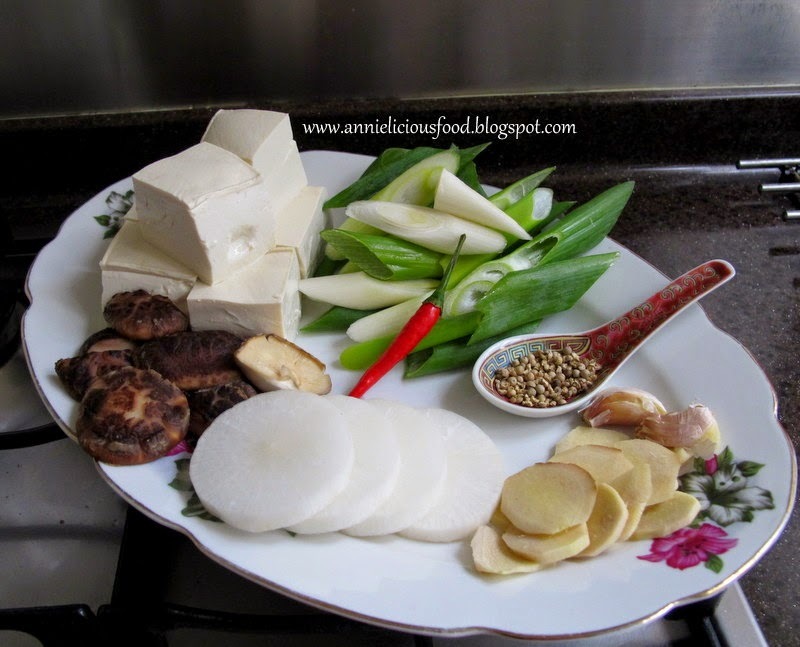 Add shao xing wine, rock sugar, fish sauce, green lime or calamansi juice and salt. Give it a stir. Taste. Add in daikon slices and bird’s eye chilli, cover lid, continue to boil for another 10mins. Taste the soup, add more salt if needed. Once it is okay, heat off, and leave it there. Until you are ready for the meal, reheat the soup, garnish with spring onions and coriander. 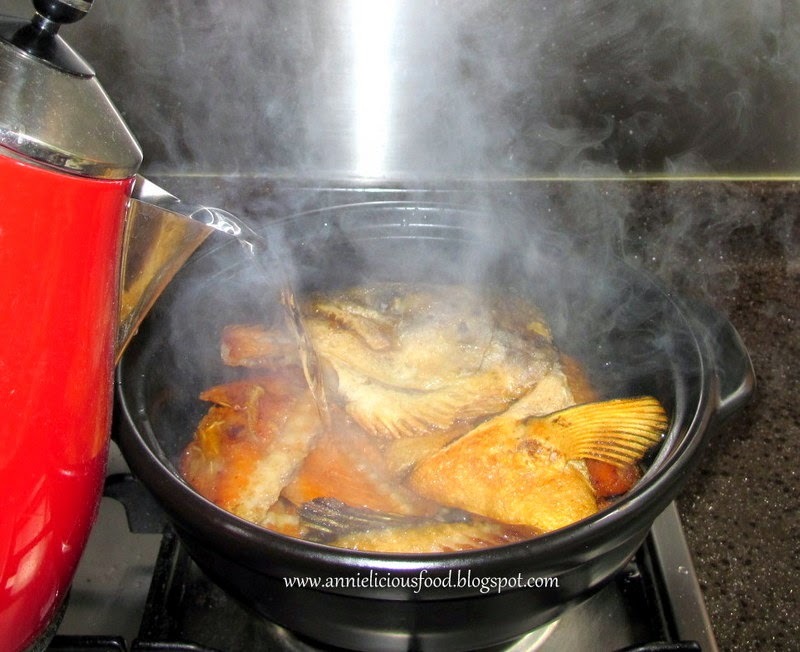 Add in the hot boiling water into the the pan-fried bones gives milky looking fish soup base. If you use room temperature water, you might not be able to achieve what you want. I need to re-emphasize, it is HOT BOILING WATER. Don’t give me lukewarm water or whatever nots. 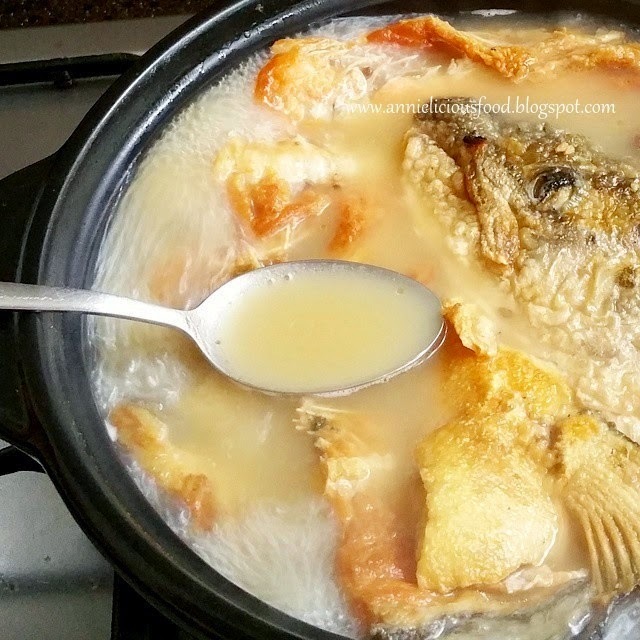 Boil the fish head and bones under high heat at the first 10 minutes is also part of the trick that gives milky appearance soup result. Ooohhh,.. Look at the milky and light brown color! Is this what you want to achieve? If yes, please DO NOT skip any steps that I mentioned earlier. My soup looked clean and very little oil. Flavorful fish bones soup and some vegetables. Yes, this is simple, economical and absolutely delicious. You don’t have to dry up your wallet to eat well. I still remember how my mother-in-law complaint to me about the fishy smell on her salmon fish bones soup that she tried cooking months ago while I’m away from home. Today, she’s actually savoring every last drop of broth in her bowl. I’m glad.